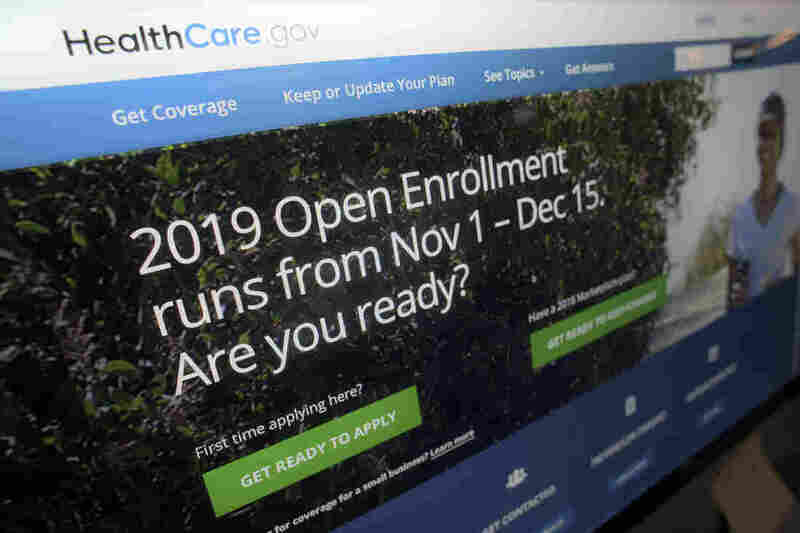 Enrollment In HealthCare.gov Plans Down Slightly For 2019 : Shots - Health News The pace of enrollment in Affordable Care Act plans was slower than in past years. About 8.5 million people enrolled in health plans for 2019 through the federal HealthCare.gov. "We should have seen modest growth this year at the very least," said Josh Dorner, of the advocacy group Get America Covered. "But in practice we faced severe headwinds because of a number of decisions made by the Trump administrations, as well as the calamitous Texas ruling on the eve of the final day of enrollment." A judge on Dec. 14 ruled that the Affordable Care Act is unconstitutional. HHS says the law will remain in place until that decision is appealed. It's unclear how the final numbers of people who get covered through the individual markets will compare to last year. That's because it's not yet clear how many people who bought insurance last year will let their policies renew automatically. And several states' enrollment deadlines are later than the federal one, so the state numbers aren't yet available. Former President Barack Obama released a video earlier this week urging people to hurry up and shop for health insurance on the Affordable Care Act exchange. "This year I'm giving it to you straight," Obama says in the video. "It's important to have health insurance in case, God forbid, you get really sick, or hurt yourself next year." Open enrollment ends in most states on Saturday and Obama makes the case that people can find a good deal on coverage if they shop around. "Most folks can find coverage for $50 to $100 per month. That's probably less than your cell phone bill," he says. After the video was released, there was a bump in sign-ups. But overall this year, enrollment in the individual market is moving more slowly than in previous years. At the end of last week, just over 4.1 million people had chosen a health plan on Healthcare.gov, according to the Centers for Medicare and Medicaid Services, which runs the website. That's about half a million fewer than at this time last year, an analysis by the advocacy group Protect Our Care shows. "I hate to panic but I do think we're going to come in low on the federal exchange, says Rosemarie Day, CEO of Day Health Strategies. Day was the founding COO of Massachusetts' state exchange, which launched in 2006, long before the Affordable Care Act became law. She blames the lower enrollment on the Trump Administration's decision to slash the advertising budget for open enrollment. Outreach, she says, is crucial to making sure that people who need insurance know where and when to get it. "The individual market is very, very volatile — because people are in and out of needing that kind of coverage," Day says. "There's always potential for new customers who may have really never paid that much attention to the exchange, because it wasn't something that they needed. It wasn't really on their radar until they did need it." CMS says it did some advertising on local TV and radio and print media, and sent out more than 600 million emails and text messages to potential consumers. Administrator Seema Verma has sent regular reminders about the enrollment period on Twitter. "We know you may be busy shopping for holiday gifts, but don't forget to shop for your healthcare coverage too! The 2019 Marketplace #OpenEnrollment deadline is this Saturday – Dec. 15th!" reads a Tweet from Thursday. But it's hard to say whether the fewer sign-ups this time mean fewer people will have insurance coverage in 2019. Katherine Baicker, an economist and dean of the University of Chicago's Harris School of Public Policy, says some Trump Administration policy changes, like eliminating the penalty for not having coverage, could depress sign-ups. At the same time, the unemployment rate fell from 4.1 percent to 3.7 percent over the course of 2018 -- the lowest level in 49 years. Having lower unemployment is certainly correlated with having a lower uninsurance rate, Baicker says, because people who are getting new jobs are going to get insurance with their new jobs. And some of those people may have previously bought insurance on the exchange. It's also hard to know how many people aren't showing up on sign-up tallies because they are just sticking with the plan they have. "People are slow to change insurance plans," Baicker says, "especially if they're happy with the plan they have." To answer those questions, a further breakdown of the total numbers will be available next year. In Virginia alone, about 70,000 fewer people have signed up for an ACA health plan this year compared to last. That may be in part because the state passed an expansion of Medicaid earlier this year, which will allow more adults to get coverage through that federal-state health insurance program. Virginia's Secretary of Health and Human Services Daniel Carey says about 140,000 Virginians have enrolled in Medicaid, so far, as part of the new expansion; that's only about half as many as the state expects to eventually enroll in Medicaid. Some of them likely had previous coverage through the exchange. "Given the co-pays and deductibles in the exchange plans, Medicaid for the individual is a much better deal," Carey says. "So if they do qualify, we certainly encourage them to enroll in Medicaid." In the end, the most important number of all is how many people end up with health coverage, Baicker says. "If fewer people are signing up in the individual market because more people are getting insurance through their jobs, that may be a very good-news story for those people," she says. "If fewer people are signing up through the exchanges because they're going to end up uninsured, that's a very bad-news story for those people." Consumers have until midnight Saturday to pick an insurance plan on HealthCare.gov.